Our plant pots are made of kaolin and the best workmanship. Don't worry about it will be broken easily. Smooth surface, Easy cleaning when you wash them. Created durable new plant pots. Delicate geometric design, suitable for house decoration, even the wedding decoration. Ideal gift for Housewarming, Birthday, Valentine's Day, Mother's Day and Christmas's Day. ☀ Comprehensive Design - Sufficient thickness to provide solid protection. Every pot has a drainage hole, and a bamboo tray to prevent water from wetting the ground. 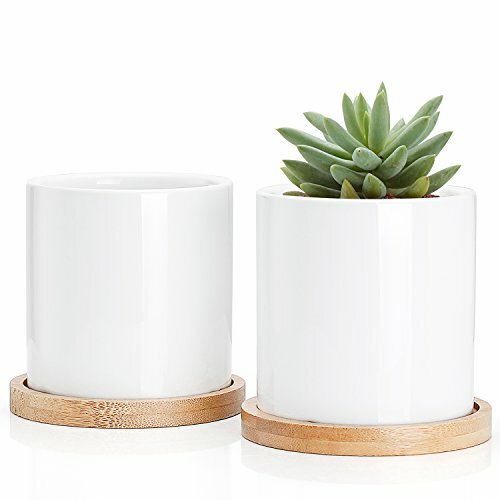 ☀ Extended Using - In addition to being the plant pots, they can become house decorations, such as candle cups, Shot glasses Carrier even wedding decoration. ☀ House Furnishing Articles - Geometric and minimalism design will make your balcony and living room more concise, bright and full of artistic sense. ☀ Gift Choice - Mini and exquisite pots, suitable for Housewarming gift, Mother's Day, Christmas's Day and wedding gift. If you have any questions about this product by Greenaholics, contact us by completing and submitting the form below. If you are looking for a specif part number, please include it with your message.